Six Lipizzans entered under Judge MS Creswick. 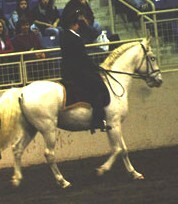 In 2003, MALA members participated in bringing Lipizzans to the public at the Horse World Expo, held at the Farm Show Complex at Harrisburg, PA.
Debuting at the 2003 Horse World Expo was Judy and her horse "Shadow"! 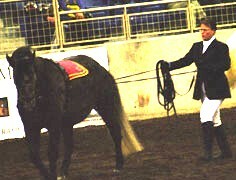 The in Hand experience - Long Lining Shadow as he is accepting cues from Judy through the Long lines. It looks like they are both having a great time too representing the Lipizzan breed at the Expo! Also Debuting at the Expo was this elegant stallion!